As evidenced by Dennis Lee’s site, The Pizzle, he’ll eat just about anything, including Play-Doh, scary-looking fertilized duck eggs, and an entire surf and turf dinner crammed violently into his juicer. But he’s also (for reasons unknown) an avid Taco Bell fan. So we sent him out into the field to try Taco Bell’s new Quesalupa and report back to us. 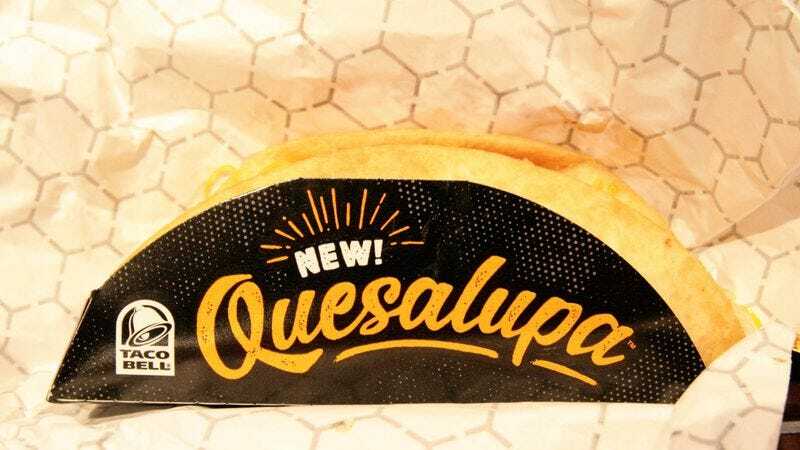 The Quesalupa was officially available on February 8th but was also available via surprise preview for a short window of time on February 6th if you ordered it online. Since large corporations aren’t good at keeping their mouths shut, it was kind of like your surprise birthday party that you knew about two weeks in advance. The internet already knew about the Quesalupa’s test run in Ohio last year, so the cat was already out of the bag. The Taco Bell in my neighborhood is one-of-a-kind; it’s the only one in the country that serves alcohol in the form of beer, along with spiked frozen slushie drinks like the Baja Blast Freeze (which I had once, and it gave me diabetes). For my visit, I ordered two Quesalupas, including the regular version, with good old ground meat from a bag, along with the higher-quality steak version for comparison. They come wrapped in pretty golden foil, making you feel like you won Willy Wonka’s golden ticket even before you eat your meal. When you unwrap the hefty beast, you’re greeted with a cheerful cardboard holder cradling your fast food surprise. I’m a fan of the cardboard sleeves as they help keep your food from getting crushed from rough treatment, even if it seems environmentally wasteful. From the outside, it looks like an ordinary chalupa, which is simply a taco supreme (meat, cheese, sour cream, lettuce, tomato) in a fried pita-like shell. I generally avoid these since the fried shell is heavy and oily—if they cut down on the grease by half, it’d be much better. The Quesalupa’s shell, unlike the regular Chalupa, is stuffed with cheese. Think of it as a deep-fried quesadilla, which in and of itself is a gluttonous idea. And it’s absolutely loaded with cheese, even if the photo doesn’t do it much justice. Every bite is packed full of melted cheese, and is actually really fun to eat as long as you eat it right away. As it gets colder, the cheese firms up quickly. I prefer the ground beef version, mainly because of the texture—the substantial chunks of steak in the higher-end variety distracts you from the texture of crisp quesadilla shell, plus the seasoning in the ground beef is flavorful enough to stand up to all the cheese. Is it great? It depends on what kind of Taco Bell items you like. It’s really heavy on the oil, but the portion is large, and the whole thing does taste pretty good. If you’re a stoner or you’re drunk late on a Saturday night, the Quesalupa will definitely fill that fast-food hole in your stomach, though it may leave you feeling a little guilty. But if you’re eating Taco Bell, you might as well go all in.